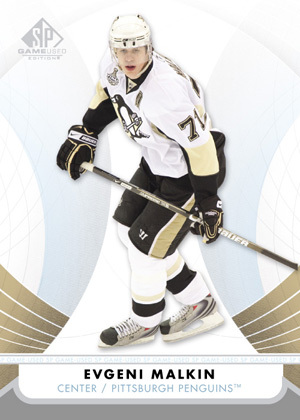 2012-13 SP Game Used Hockey sees a new configuration that now promises an autograph or memorabilia card in every pack. Several of the memorabilia sets offer more unique pieces as well. 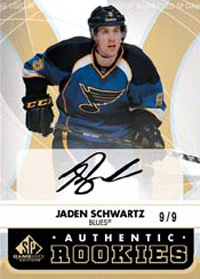 Every five-pack box of 2012-13 SP Game Used Hockey has one autograph and four additional hits. These include a combination of signature and game-used cards. 2012 Stanley Cup Finals Materials feature pieces of the nets used in the third, fourth and sixth games of the Finals between the Los Angeles Kings and New Jersey Devils. Besides the netting, collectors can find premium pieces with the skirts and NHL shield logo. Supreme Patches, Supreme Skates and Supreme Sticks have over-sized memorabilia pieces. 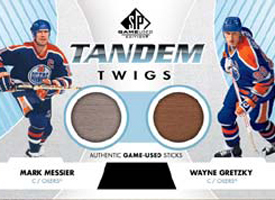 Tandem Twigs have stick pieces from two different players. Game Gear cards include multi-swatch combinations of different pieces of game-used memorabilia. The Draft Day Marks checklist mixes autographs of veterans and rookies. Authentics Rookies get a new spin. 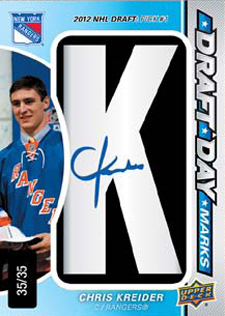 Each of the rookie cards are numbered to the player's jersey number. They also have one-of-one autograph parallels. 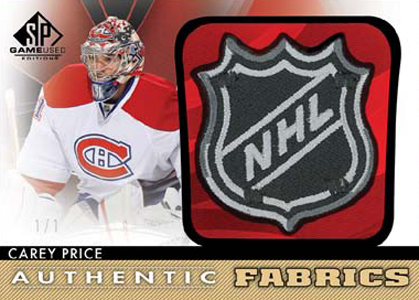 Another parallel is the Authentic Fabrics NHL Shield Variations. This marks the first appearance of the one-of-one cards in an SP Game Used Hockey product. I love the idea of thees cards! Im always so excited to get a phisical peice of history, really makes thees cards spectial. Gave it a 4 because of price point (good). Some excellent cards in this product. 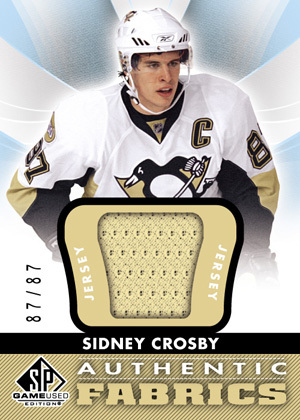 One complaint is they really over did the Team Canada jerseys and there are a lot of white patches on the multi patch cards. Upper DEcks answer to Titanium. Well done. i buy many pack from ths set grab lots of cool thing like a letter auto , 6 jersey on the same card, a cord net, stamkos auto, and yesterday hit a game gear or jonathan toews.. absoutely awsome !! I pulled the authentic fabrics 8 af8-allstar lemieux/gretzky/jagr/lindros/roy/brodeur/belfour/joseph any idea what the value of it is? possibility of catching a very big card. However too much importance given to marginal players. Cards listed over $100.00 should be stars.